Papaya leaf curl disease is caused by Papaya leaf curl virus (PaLCuV), a begomovirus naturally transmitted through whitefly (Bemisia tabaci). Main symptoms of papaya leaf curl disease are inward/outward curling of plant leaves, vein thickening, and stunted plant growth with small distorted fruits or no fruits. Papaya leaf curl virus is a major threat for the crop production, and the virus has the capability to adapt new plant hosts very rapidly which helps in their host range extension that also has emerged as an evolving risk in papaya production. Whitefly management is the main method to control the spread of this virus so far. 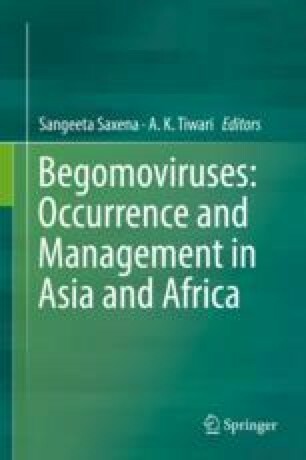 Several diagnostic techniques especially molecular techniques have been developed to detect the begomoviruses at early stages of infection to control the further spread of the begomovirus, but so far not much reports are available to control the begomoviral infection at later stage. This chapter provides the information about many aspects like causal pathogen, vector responsible for disease spread/transmission, host range and phylogenetic analysis of virus associated with the papaya leaf curl disease, and different resistance approaches for possible management of the disease.